Home-school advantage: choice or segregation? The best school for your children may not be the one within walking distance. Instead of being theoretically tied to their neighborhood school, city kindergarteners next school year will have a choice of several schools. The schools available to them depend on which zone they live in. 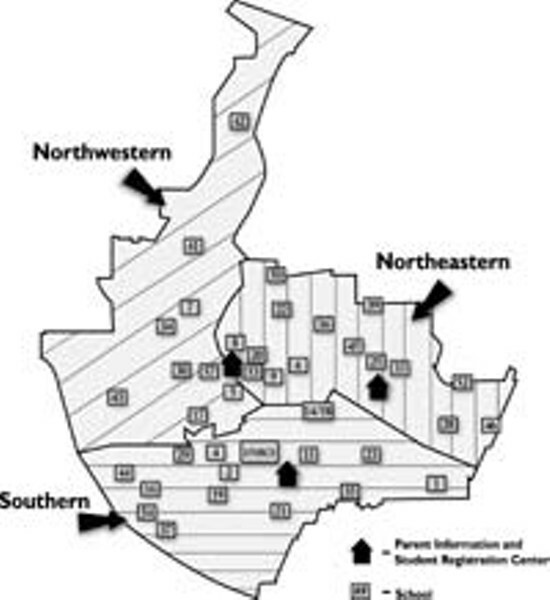 The city school district has been divided into three zones: northeast, northwest, and south. The new Parent Preference/Managed Choice Policy was adopted by the city school board late last year. The prime drivers, according to school board member Willa Powell, are the district's busing rate, fairness and equity for all city students, and the concept of structural displacement. "Our children are not where our schools are and vice versa," she says. Magnet schools saved Rochester from implementing a choice policy up until now. "Boston's choice model went into effect about the same time this district was doing magnet schools as a way of doing voluntary transfers, voluntary busing," Powell says. "So we kind of dodged the bullet. The only reason we didn't have a lawsuit here is that in New York, we responded with magnet schools. Well, magnet schools lost their emphasis when they lost their funding." The biggest complaint about the new policy is that there is no guarantee kids will be able to attend their neighborhood school. School officials say a guarantee is irrelevant. But a citizens' group is pushing for a policy amendment guaranteeing kids the right to attend their neighborhood school. And the movement is picking up steam, winning the support of Rochester Teachers Association President Adam Urbanski. Mayor Bill Johnson has not called for the amendment, but says he understands the group's concerns. He's also been quoted as saying that the outrage over the policy is just the kind of thing that drives people out of the city. Concerned Citizens for City Living, the group pushing the amendment, says the policy, as is, will hurt the school district and the city as a whole. "Obviously, the city is trying to revitalize itself. And I just think that this type of policy is going to discourage people from moving into the city," says group spokesperson Skip Pleninger. "If somebody comes into a neighborhood, that's the first question they ask, 'Where's my child going to go to school?' I think that commitment to city living is going to decrease and people are going to move out to the suburbs." The group also expects parental involvement in the schools to drop as people lose the sense of ownership and pride of neighborhood they associate with their home schools. With the guarantee in place, then parents can go out and explore other schools, Pleninger says. As it stands now, 60 percent of the openings at each school will be reserved for neighborhood residents living with a half-mile radius of the schools. The remaining slots are for non-neighborhood residents, if they apply. But Superintendent Manuel Rivera, responding to community concerns, recommended creating a "transitional year" for the plan at Monday's policy committee meeting. Rivera wanted neighborhood slots bumped to 75 percent and to drop the half-mile radius in favor of using existing home-school boundaries. The committee agreed to send a compromise proposal to the school board for its consideration next Thursday night, February 12. In it, 70 percent of the openings would be for neighborhood students. The committee also agreed to temporarily use existing home-school boundaries to determine neighborhood schools. Registration would also be postponed if the school board follows Rivera's recommendation. It would start in April instead of March in order to give the residents more time to understand the new plan. The policy will be reevaluated in the fall, Rivera says, to see if more changes are needed. The original 60/40 ratio matches the reality that the district is already busing 40 percent of its students due, in part, to structural displacement. The choice policy, Powell says, just keeps that ratio intact. "It meant that even though School 46 [for example] can't fill its seats beyond the 40 percent rate, we said, 'Every school, 60 percent,'" Powell says. "Which we thought was more than fair." Some of the 40 percent, Powell says, is not the result of structural displacement, but because of creative parents. "Some of that 40 percent is parents that have figured out how to manipulate the system. They've found openings in schools that, in theory, they have no claim to," Powell says. "Is it fair some people have figured out how to move their children from one school to another by back-door means? If you're an in-the-know parent you can gain access to schools, but if you play by the rules, you can't?" Allowing parents to manipulate the system creates schools stacked, Powell says, with exemplary students. "What happens is you're adding affluence to affluence and coming up with schools that simply do not reflect city living, and concentrating poverty more severely in other schools," she says. It also removes an active, involved parent from a climate "where that exact kind of leadership could have turned that school around," Powell says. Board member Rob Brown says the amendment proposed by the citizens' group is irrelevant. "It turns out that if you have 60 percent neighborhood preference in a school, that it is numerically and functionally identical with 100 percent neighborhood preference in all our schools... because of the numbers," he says. "We don't have a lot of neighborhood kids in our schools. Our schools are not in the same place as our students are." "So what happens is you bring people into the schools from other places, because we're obviously not going to put our schools on wheels and move them around to where the students are." The worry, of course, is that parents won't get their school of choice. But the goal is for 80 to 90 percent to get their top choice and for zero to not get at least one of their top three choices, Powell says. "There are so many ways that a child can get into a school under the new system," she says. "It's just a case of the new system is not familiar to parents." Anyone who doesn't get in has the option of sitting on a waiting list and from there, several things can happen, Powell says. Children can move out of the district, freeing up slots. Or the superintendent can increase class sizes, which would, again, free up more slots. The district purposely set capacity at the outset below the maximum, Powell says, which provides some wiggle room for students who move into the district after registration is over. It also gives the district the option to increase capacity once officials evaluate how the policy shakes out. "It's possible that every person who applies for a school will get in, depending on how many people apply," she adds. "The only time we have a conflict is if the school is truly over chosen." People complaining about the policy are putting out a lot of misinformation, Brown says. Those who claim they moved into a neighborhood because the school is high performing, he says, often don't know what they're talking about. "They all say their schools are high-performing schools," he says. "In fact, they're mostly wrong about that because they actually don't pay much attention to that. They just make it up." Brown uses School 46 parents "who are now telling us that their school is the highest-performing school in the city or something" as an example. School 46, he says, performs about the same as School 43, "which is demographically a very different school," Brown says. "It's a lot poorer and has a higher percentage of children of color," he says. "[School 46] performs substantially worse than School 7 and worse than School 15 or 23." According to the State Education Department, the passing rate for fourth graders at School 46 in 2003 on the state tests is 63 percent in English and 59.3 percent in math. The school's trends in both areas, Brown says, are negative. School 43, a much poorer school, has a 58.9 percent passing rate in English and 65.3 percent in math. Trends in both areas are positive. The highest consistent performers in the district are School 15, with an English pass rate of 87 percent, and School 1, with a math pass rate of 93.9 percent. School 15 is a citywide draw school, Brown says, and School 1 is a neighborhood school with virtually no neighborhood children attending. "If we look at the places where people are so very concerned...Who have made a decision that presumably has tied their real estate to their school choices, we do not find that these are the most successful schools," Powell says. "The schools who are clamoring the most are not our top-performing schools. If parents make decisions based on what schools are succeeding, there's no reason to believe that School 46 will be over chosen." No choice policy deserves that name, says Urbanski, if it doesn't include parents' choice to send kids to their neighborhood school. The district should guarantee that right, he says, and then give parents accurate and timely information about all schools so they can make a truly informed choice. Information in hand, parents might not necessarily choose the highest-performing school, Urbanski says, but the one whose programs meet their individual needs. The school board is saying that choice must come at the expense of neighborhood schools, Urbanski says, but he believes the district can have both. The worst-case scenario, he says, is that the race card gets played. "I would not support neighborhood schools if the trade-off would be integrated schools," he says. "Integration is more important than neighborhood schools." Integration is exactly what's on Adam McFadden's mind. McFadden represents the south district on city council. McFadden has much to learn about the policy, he says, but his concern is that without it, "poor kids or black kids" would be shut out from higher-performing schools. "I'm scared that you have a particular group --- a group that may be in the higher income in the city --- actually trying to protect their neighborhood school from letting poor kids into it. I don't know enough to say that's the case. I just want to make sure," he says. "No one should be held captive by a low-performing school." McFadden doesn't buy the argument that the policy will chase people out of the city. They're already leaving, he says. "Education is already hurting the city. People move when their kids turn about middle-school age now," he says. "It's not about school choice more than it is about performance. If the schools are performing, you won't have anyone fighting to leave."